This is an electronic version (PDF) and upon purchase, you will receive a confirmation e-mail with a link to download the file. With the implementation deadline for Accounting Standards Update (ASU) No. 2014-09, Revenue from Contracts with Customers (Topic 606) fast approaching, how can you prepare for the changes? 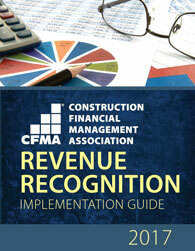 CFMA’s Revenue Recognition Implementation Guide is the step-by-step guide to successful implementation, offering best practices on developing an implementation task force; identifying a timeline for implementation; and the impact of the regulations on existing internal accounting systems, tax planning, and more.